Hui the Yogini: Weight lifting... a man sport? I can easily recall my first ever session with a Personal Trainer. It was my first year of uni, I was ready to make a new start, and was just about to realize my New Year's resolution by getting my first ever gym membership. That question though, still hung in the air. "Are you really sure you don't want any weights in your fitness program?" his eyebrow raised in slight disbelief. Let's see. I grew up in a Malaysian semi-rural town, where an adult female could easily (and quite normally) weigh below 40kg. I was raised in a family where Mum would tell me not to do pushups because it would "make my shoulders too broad". I grew up through the 90s, when waif-life Kate Moss was the pin-up girl for beauty everywhere, when it was the age of the supermodels, all delicate, reed-like, gentle ladies. I studied in an all-girls school, where being too physically strong gave you the lesbian label. So, was I sure then? Hell yeah. Nearly eight years down the track, I still haven't really incorporated weight lifting/strength training into my routine. While I no longer aspire to be Kate Moss, I still had my reservations until I read Nia Shanks' enlightening blog post on Tribesports about women and strength training. And it really hit home... I've never really done it because I was simply too afraid that one day I would look like a man. Maybe it was the circumstances of my upbringing. But, believe it or not, it wasn't too long ago that I said that Katee Sackhoff looked like a man (calm yourselves, BSG Starbuck groupies)... very recently though, I've come to the realization that there is no way in hell Katee looks remotely manly, in fact, if she looked like a man, I'd be more than happy to look like a man too. If Katee Sackhoff looked like a man, she would be a very attractive, feminine man. What does looking like a man mean anyway? Broad shoulders, toned, built arms? These are all gender archetypes that we've assigned and given meaning to. Just like sports. There are "male" activities, and then there are "female" activities. Quick activity: Assign a gender to the following sports: Skateboarding, snowboarding, yoga, weight-lifting, football, skiing, figure skating, gymnastics. See my point? There's hope yet though. Think about it, there was once a time when women didn't do pushups, unless of course you were Nancy Wake (the badass Australian female spy). Sooner or later, there will be more women lifting weights as well. Times are changing, after all. Interested in testing the waters? Nia has created a strength building guide to help with strength training. 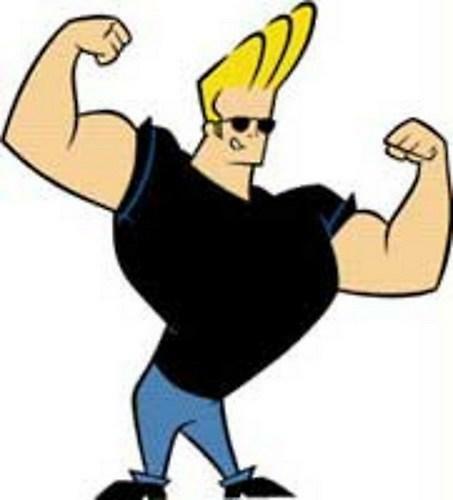 And, in case you were wondering if lifting heavy weights does make you look like Johnny Bravo, why not read Nia's blog post to see for yourself? Me? I'm taking baby steps... starting with those pushups (sorry Mum! ).